The Westminster end of Victoria Embankment and PS Tattershall Castle, pictured in 2009. 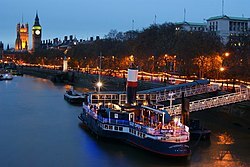 As well as being a major thoroughfare for road traffic between the City of Westminster and the City of London, it is noted for several memorials, such as the Battle of Britain Monument, permanently berthed retired vessels, such as HMS President, and public gardens, including Victoria Embankment Gardens. Victoria Embankment under construction in 1865. Electric light provided by Yablochkov candles in December 1878. The Victoria Embankment's construction started in 1865 and was completed in 1870 under the direction of Joseph Bazalgette. It was part of a three-part work, the other two parts being the Albert Embankment, from the Lambeth end of Westminster Bridge to Vauxhall; and the Chelsea Embankment, extending from Millbank to the Cadogan Pier at Chelsea, close by Battersea Bridge. It was a project of the Metropolitan Board of Works. The contractor for the work was Thomas Brassey. 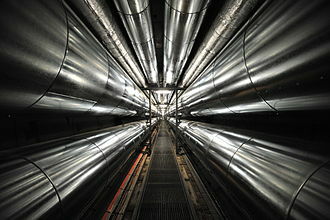 The original impetus was the need to provide London with a modern sewerage system. Another major consideration was the relief of congestion on the Strand and Fleet Street. The project involved building out on to the foreshore of the River Thames, narrowing the river. The construction work required the purchase and demolition of much expensive riverside property. The cut-and-cover tunnel for the District Railway was built within the Embankment and roofed over to take the roadway. The embankment was faced with granite, and penstocks, designed to open at ebb tide to release diluted sewage when rainstorms flooded the system, were built into it as a means of preventing backups in the drainage system and of periodically flushing the mud banks. At ground level, in addition to the new roads, two public gardens were laid out. One of these backs onto the government buildings of Whitehall, and the other stretches from Hungerford Bridge to Waterloo Bridge. The gardens contain many statues, including a monument to Bazalgette. The section of the gardens between Waterloo Bridge and Charing Cross station also includes a large bandstand, where musical performances are given, and the 1626 watergate of the former York House built for the first Duke of Buckingham. The Victoria section was the most complex of the three sections. 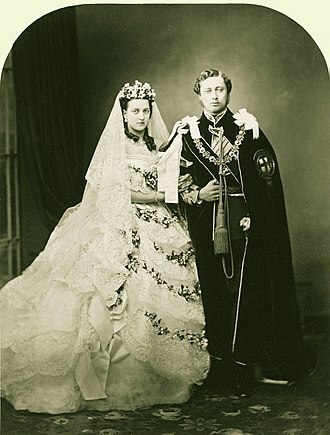 It was much larger, more complex and more significant to the metropolis than the other two and officially opened on 13 July 1870 by the Prince of Wales and Princess Louise. When people refer to "the Embankment" they are usually referring to that portion of it. 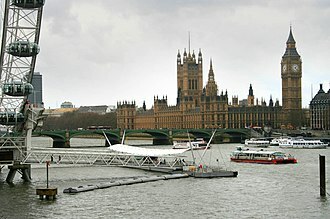 The total cost of the construction of the Victoria Embankment is estimated to be £1,260,000 and the purchase of property at £450,000. The total cost includes the cost of materials used in the construction of the embankment. Construction of the Victoria Embankment proved to be difficult because of the grandness of it. Parliament was assured that three years would be ample time to complete the project, which did not hold to be true. They had an inadequate labour force along with issues of the architect and property appraiser securing all the wharves and other property needed for access and storage in a timely manner. There was also difficulty in acquiring contract requirement to maintain access to steamboat landings at Westminster and Hungerford. In addition, time and money was lost in experimenting with a new type of cofferdam, a structure used to keep water out of the construction site, crucial for building along the tidal Thames. In December 1878 Victoria Embankment became the first street in Britain to be permanently lit by electricity. The light was provided by 20 Yablochkov candles powered by a Gramme DC generator. 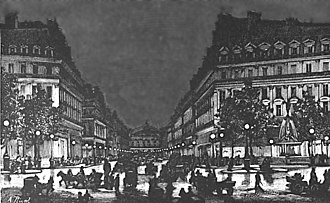 16 March 1879 the system was extended to 40 lamps and 10 October to 55 lamps. Previously the street had been lit by gas, and in June 1884, gas lighting was re-established as electricity was not competitive. The Victoria Embankment (part of the A3211 road) starts at Westminster Bridge, just north of the Palace of Westminster, then follows the course of the north bank, past Hungerford Bridge and Waterloo Bridge, before ending at Blackfriars Bridge in the City. 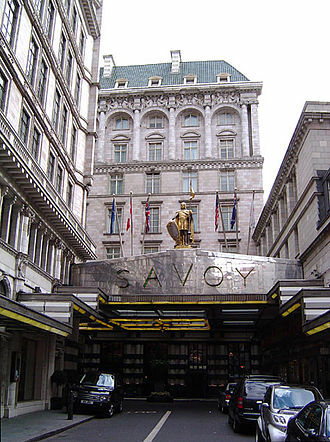 Shell Mex House, the Savoy Hotel and Savoy Place are located between the Embankment and the Strand. London Underground stations along Victoria Embankment are Westminster, Embankment, Charing Cross, Temple and Blackfriars. The former Aldwych station (closed in 1994) was also located nearby. London Buses route N550 is the only bus route along the Embankment, providing an overnight service when the tube is shut. Victoria Embankment was also the southern end of the Kingsway Tramway Subway. It was also used by trams as a loop right up until the end of the original tramway system in London in 1952. London River Services boat services operate from Westminster Millennium Pier, Embankment Pier and Blackfriars Millennium Pier at points along Victoria Embankment. Pleasure cruises operate from Savoy Pier. London's East-West Cycle Superhighway, a kerb-protected cycle track across London, runs along most of the Victoria Embankment: it opened in 2016. The embankments were designed as a contribution to "the appropriate, and appropriately civilized, cityscape for a prosperous commercial society." 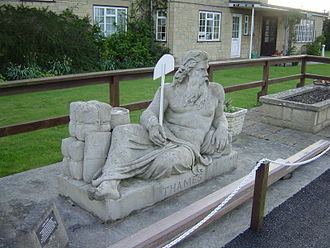 John Thwaites, the chair of the Metropolitan Board of Works, made note that the embankments were an important step in making London recognised as an exemplary imperial city, and that the embankments were the greatest public work to be taken in London. 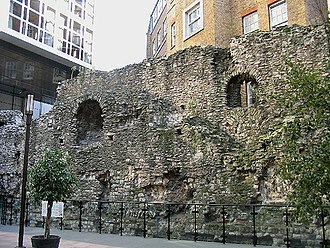 This imperial power was represented in the embankments' grandeur and could be seen in the way they controlled nature, linking the local experience of nature in London to the global rivalries of imperial powers. On the river side, new steamboat piers and landing stairs were designed for river access. Above ground were tree lined roadway and pedestrian walkways, surfaced with York paving stone and decorative gaslight posts for the top of the wall. 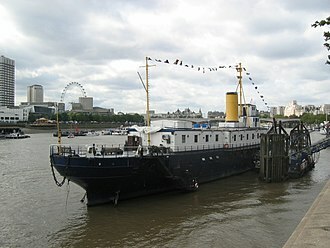 Ships permanently moored by Victoria Embankment include HMS President, HMS Wellington, and PS Tattershall Castle. Other notable attractions include the General Charles Gordon Memorial, Royal Air Force Memorial, National Submarine War Memorial, Battle of Britain Monument, Cleopatra's Needle and the modernistic Cleopatra's Kiosk. ^ Walker, Charles (1969). Thomas Brassey, Railway Builder. London: Frederick Muller. p. 151. ISBN 0-584-10305-0. ^ a b c d Porter, Dale (1998). The Thames Embankment: Environment, Technology, and Society in Victorian London. Akron, OH: U of Akron. ISBN 1-884836-29-1. ^ Baker, Margaret (2002). Discovering London Statues and Monuments. Osprey Publishing. p. 125. ISBN 9780747804956. ^ "History of Electricity". Archived from the original on 25 June 2012. Retrieved 16 June 2012. ^ a b Electricity Supply in the UK: A chronology (PDF). Electricity Council. 1987. pp. 11–12. ^ Marshall, Prince (1972). Wheels of London. The Sunday Times Magazine. p. 50. ISBN 0-7230-0068-9. Retrieved 15 October 2013. Aldwych is a closed station on the London Underground, located in the City of Westminster in Central London. 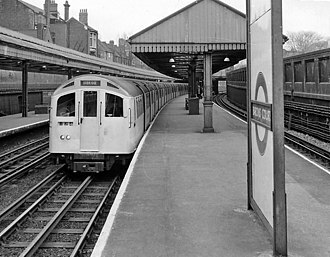 The station building is close to the Strands junction with Surrey Street, during its lifetime, the branch was the subject of a number of unrealised extension proposals that would have seen the tunnels through the station extended southwards, usually to Waterloo. Served mostly by a train and having low passenger numbers. Service was offered only during peak hours from 1962 and discontinued in 1994. Disused parts of the station and the tunnels were used during both world wars to shelter artworks from Londons public galleries and museums from bombing. The station has long been popular as a location and has appeared as itself. In recognition of its significance, the station is a Grade II listed building. The Great Northern and Strand Railway first proposed a station in the Strand area in a bill presented to Parliament in November 1898. Royal Assent to the bill was given and the Great Northern, in September 1901, the GN&SR was taken over by the Brompton and Piccadilly Circus Railway, which planned to build an underground line from South Kensington to Piccadilly Circus via Knightsbridge. 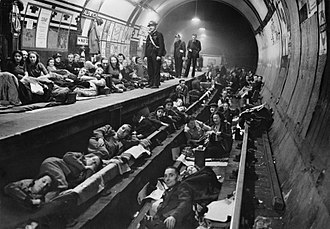 Neither of the railways had carried out any construction, but the UERL obtained permission for new tunnels between Piccadilly Circus and Holborn to connect the two routes, the companies were formally merged as the Great Northern and Brompton Railway following parliamentary approval in November 1902. The extension was rejected following objections from the Duke of Norfolk under whose land the last part of the tunnels would have run. In 1903, the GNP&BR sought permission for a branch from Piccadilly Circus to run under Leicester Square, the branch would have passed and interchanged with the already approved Strand station, allowing travel on the GNP&BR from Strand in three directions. The deliberations of a Royal Commission on traffic in London prevented parliamentary consideration of the proposal, in 1905, with the Royal Commissions report about to be published, the GNP&BR returned to Parliament with two bills for consideration. The first bill revived the 1903 proposal for a branch from Piccadilly Circus to the City of London, the second proposed an extension and relocation of Strand station to the junction of Strand and Surrey Street. Thomas Brassey was an English civil engineering contractor and manufacturer of building materials who was responsible for building much of the worlds railways in the 19th century. By 1847, he had built about one-third of the railways in Britain and this included three-quarters of the lines in France, major lines in many other European countries and in Canada, South America and India. He built the structures associated with railways, including docks, viaducts, tunnels. As well as engineering, Brassey was active in the development of steamships, locomotive factories, marine telegraphy. The Brassey family traced back to a Norman ancestor from the town of Brécey in Lower Normandy who crossed to England with William the Conqueror in 1066. Initially their home was at Bulkeley, near Malpas in Cheshire, at some time, and certainly by 1663, the family moved to Manor Farm in Buerton, a small settlement in the parish of Aldford,6 miles south of Chester. Thomas Brassey was the eldest son of John Brassey, a prosperous farmer, Thomas Brassey was educated at home until the age of 12, when he was sent to The Kings School in Chester. Aged 16, he became an apprentice to a land surveyor and agent. 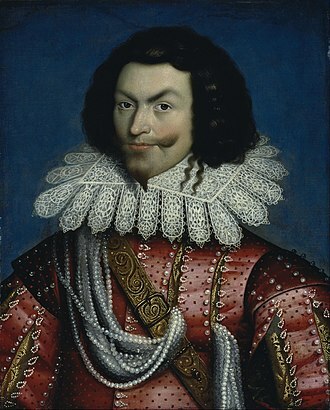 Lawton was the agent of Francis Richard Price of Overton, during the time Brassey was an apprentice he helped to survey the new Shrewsbury to Holyhead road, assisting the surveyor of the road. While he was engaged in work he met the engineer for the road. When his apprenticeship ended at the age of 21, Brassey was taken into partnership by Lawton, forming the firm of Lawton, Brassey moved to Birkenhead where their business was established. Birkenhead at that time was a small place, in 1818 it consisted of only four houses. The business flourished and grew, extending into areas beyond land surveying, at the Birkenhead site a brickworks and lime kilns were built. The business either owned or managed sand and stone quarries in Wirral, amongst other ventures, the firm supplied the bricks for building the custom house for the port which was developing in the town. When Lawton died, Brassey became sole manager of the company and sole agent and it was during these years that he gained the basic experience for his future career. A cofferdam is a temporary enclosure built within, or in pairs across, a body of water and constructed to allow the enclosed area to be pumped out. This pumping creates a dry environment for the major work to proceed. Enclosed coffers are commonly used for construction and repair of oil platforms, bridge piers and these cofferdams are usually welded steel structures, with components consisting of sheet piles and cross braces. Such structures are typically dismantled after the work is completed. These cofferdams are typically a conventional embankment dam of both earth- and rock-fill, but concrete or some sheet piling may be used. Typically, upon completion of the dam and associated structures, the downstream coffer is removed and the upstream coffer is flooded as the diversion is closed and the reservoir begins to fill. Dependent upon the geography of a dam site, in some applications, when complete, the cofferdam is removed and a similar one is created on the opposite side of the river for the construction of the dams other half. The cofferdam is used on occasion in the shipbuilding and ship repair industry. An example of such an application is certain ship lengthening operations, in some cases a ship is actually cut in two while still in the water, and a new section of ship is floated in to lengthen the ship. Torch cutting of the hull is done inside a cofferdam attached directly to the hull of the ship, the cofferdam is replaced while the hull sections are welded together again. As expensive as this may be to accomplish, use of a drydock may be more expensive. A 100-ton open caisson that was lowered more than a mile to the sea floor in attempts to stop the flow of oil in the Deepwater Horizon oil spill has been called a cofferdam and it did not work, as methane hydrates froze in the upper levels preventing the containment. A cofferdam may refer to a space between two watertight bulkheads or decks within a ship. A cofferdam may be a space or a ballast space. Cofferdams are usually employed to ensure oil or other chemicals do not leak into machinery spaces, if two different cargoes that react dangerously with each other are carried on the same vessel, one or more cofferdams are usually required between the cargo spaces. HMS President painted by Tobias Rehberger in 2014 to commemorate the use of dazzle camouflage in World War I. 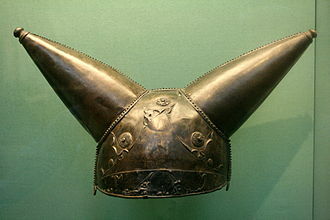 Although a design this elaborate would not have been used in practice, it still requires more than a casual glance to work out which end of the ship is which. Yablochkov candle with part of the bulb removed to show the two parallel carbon rods separated slightly from each other by a layer of plaster of Paris. Interior of subway, looking south (April 2004).